Foodies, what would be the best dish to have when friends are coming along over the weekend in the Winter? My suggestion is having a pulled pork fiesta so everyone can enjoy their favorite way of the pulled pork. 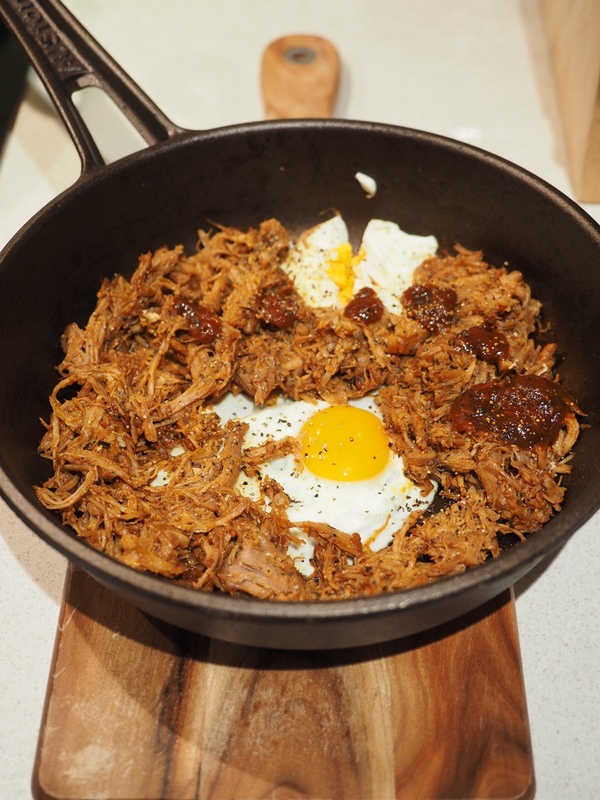 The cooking method is believed to originate in the United States, but around the world, there are many different forms of pulled porks. In most of recipes of pulled pork, it requires low temperatures and an extensively long period of time to cook (6 hours ish). It is both not economical and not convenient for home cooks, especially when there are guest to come to visit. 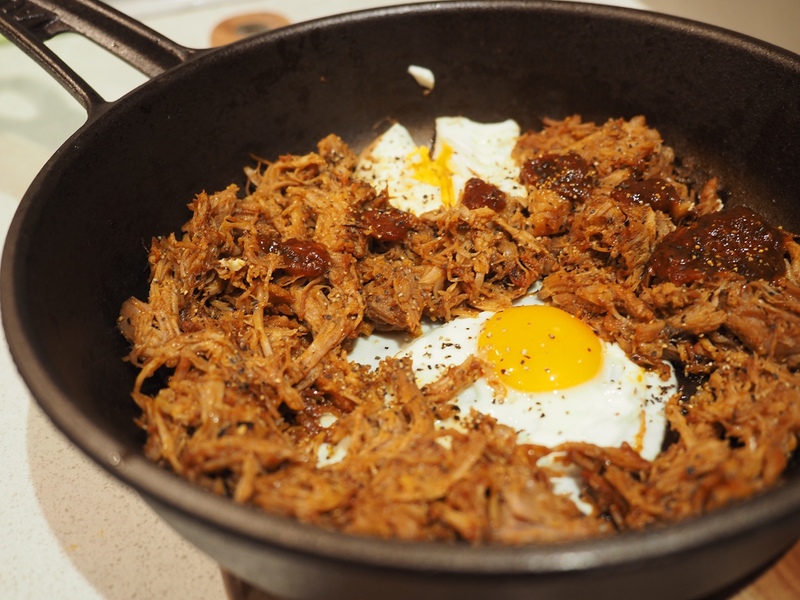 Hence, I developed this easy recipe myself using a combination of electric pressure cooker and a cast iron casserole, so everyone can get a satisfactory pulled pork dish in less than 90 minutes. If you are still in the hunt for a good pork, I recommend you to try Murray Valley Pork. 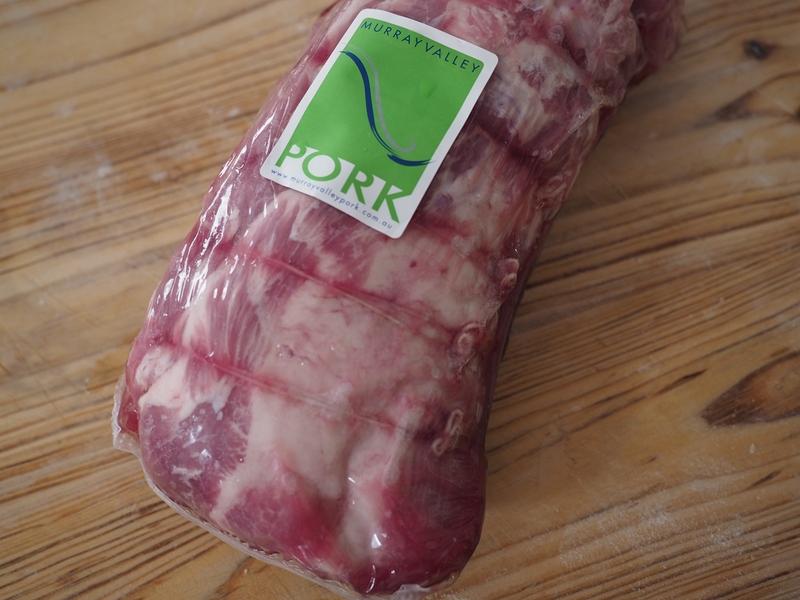 Being one of Australia’s best pork producers, the pork products from MV Pork is of top quality. I’ve used their products for a number of my dishes. MV Pork do special products that will suit many events such as Easter, Christmas and Australian Day. Murray Valley Pork products are available in Feast Fine Foods in Adelaide Central Market. 1. 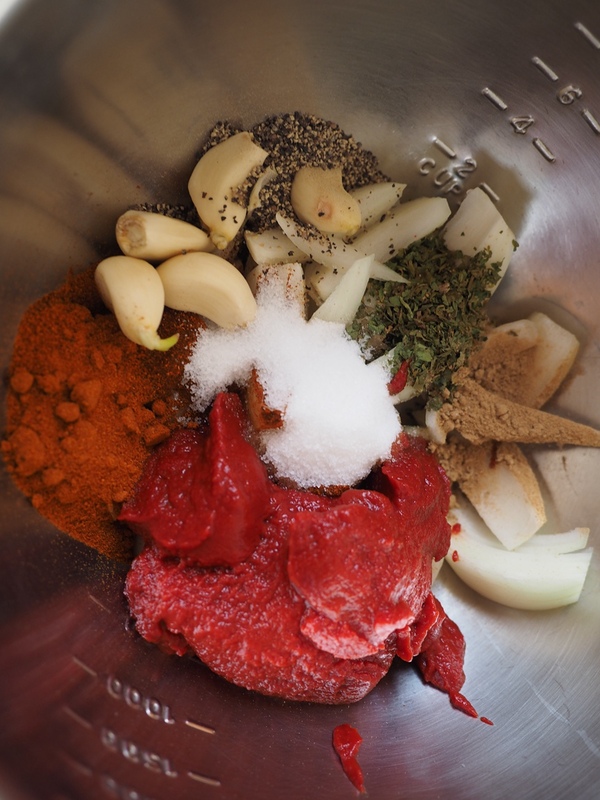 Place all ingredients listed in the “To make the paste” section into a mixing bowl. 2. Cut the pork scotch into 3 equal pieces and place in the bowl. 4. Transfer the content in the mixing bowl into an electric pressure cooker and add the 4 cups of water. Cook for 45 minutes. 5. At the end of the 45 minutes mark, allow the pressure cooker to cool and release the gas if you wish to accelerate the process. 6. Transfer all the content in the pressure cooker into a cast iron casserole. Season to taste. This is purely to suit your preference so you can put the appropriate amount of salt according to your liking. 7. Now, put the casserole on high heat and cook for about 30 minutes until the sauce is quite concentrate and the oil is separated out a bit as shown below. During this time, you may smell some charred smoky flavours but that’s absolutely normal and you can easily get the charred mark off the cast iron by using sodium bicarbonate. 8. 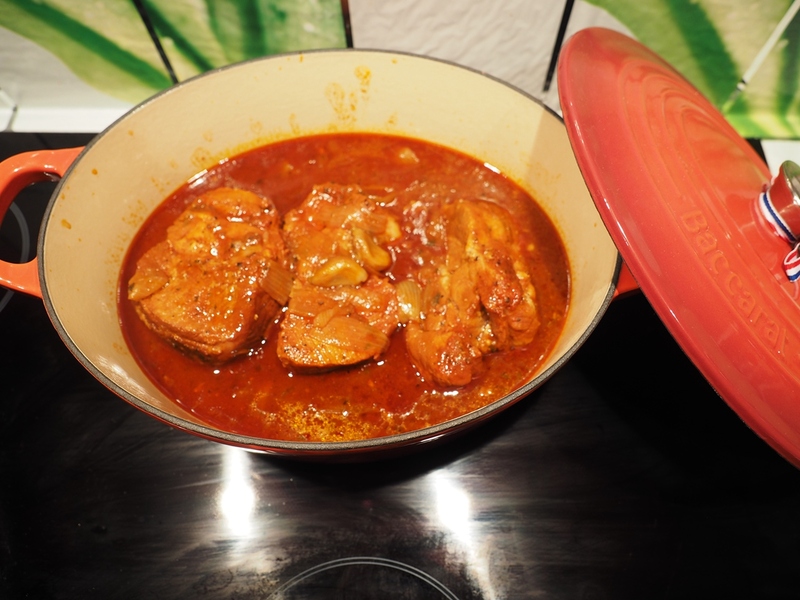 Take the 3 pieces of porks out into a bowl and using two forks to carefully separate the meat. Have a look below, the meat is very easy to be separated or pulled apart and it is also indeed very soft and tender with plenty of aromas on the nose. I tried to take a piece and tasted myself – it is delish! 9. 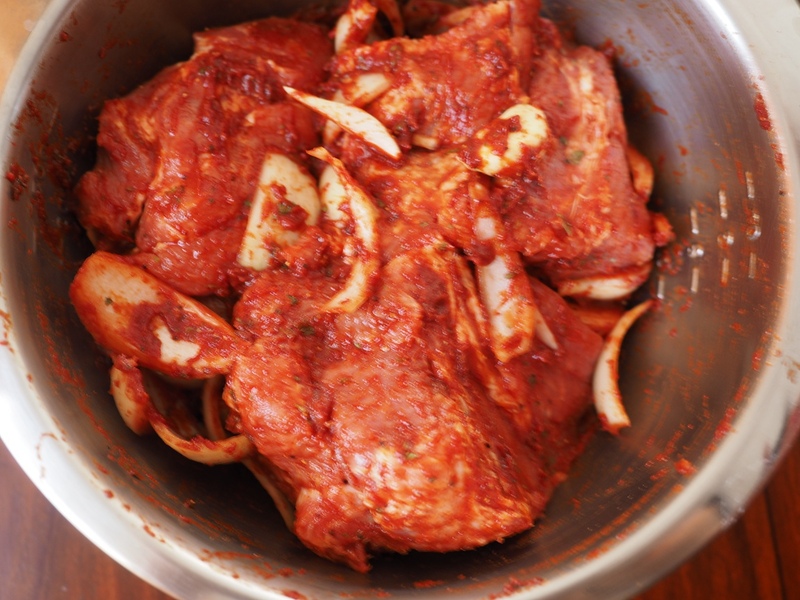 After pulling the pork, it should look something like the photo below. 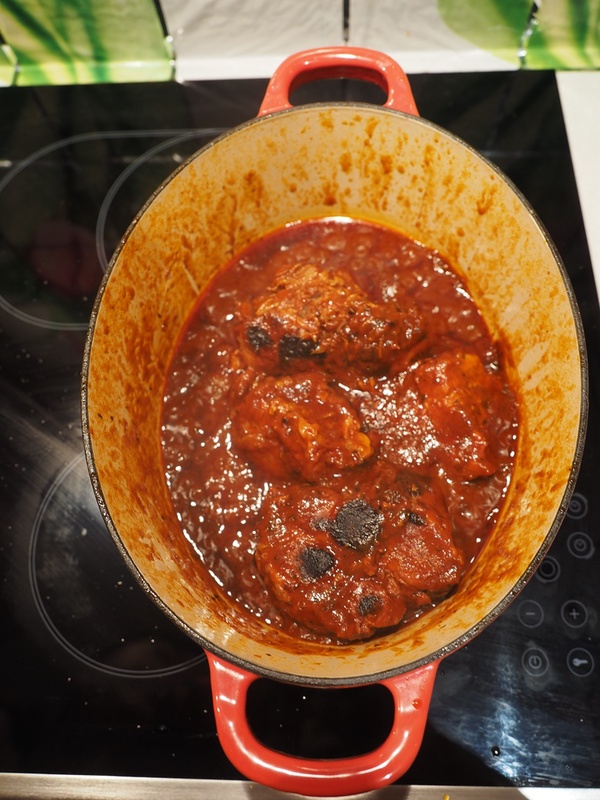 The pork is now very flavoursome but if you like more flavours, you can dip the meat back into the sauce. 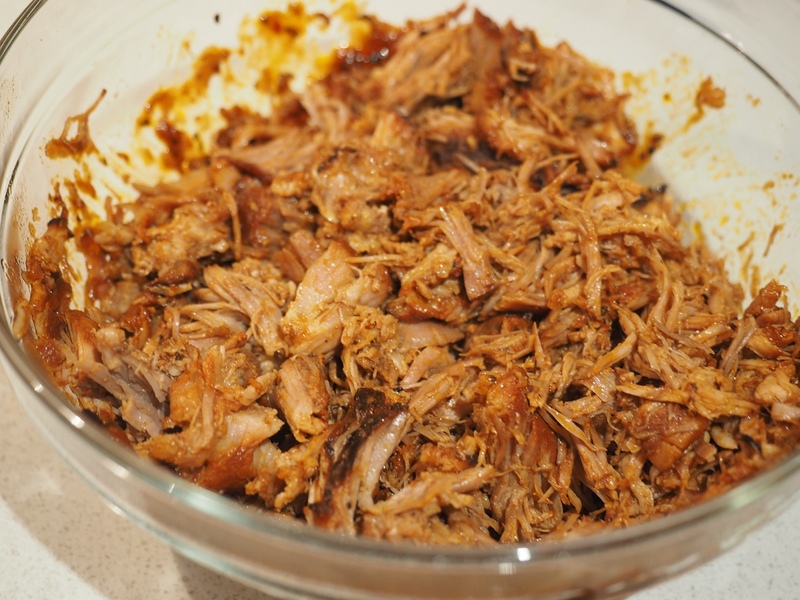 By now, the pulled pork is cooked and you are ready to use it for any other dishes. You can store the meet in the fridge separate from the sauce and can reheat in a pan whenever you need to use it. 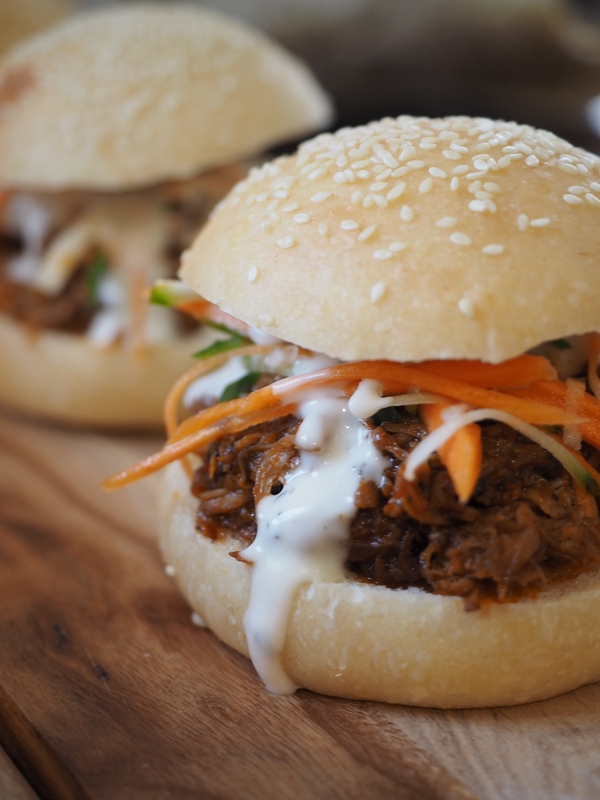 So for the following, they are purely some ideas on how you can serve your pulled pork. 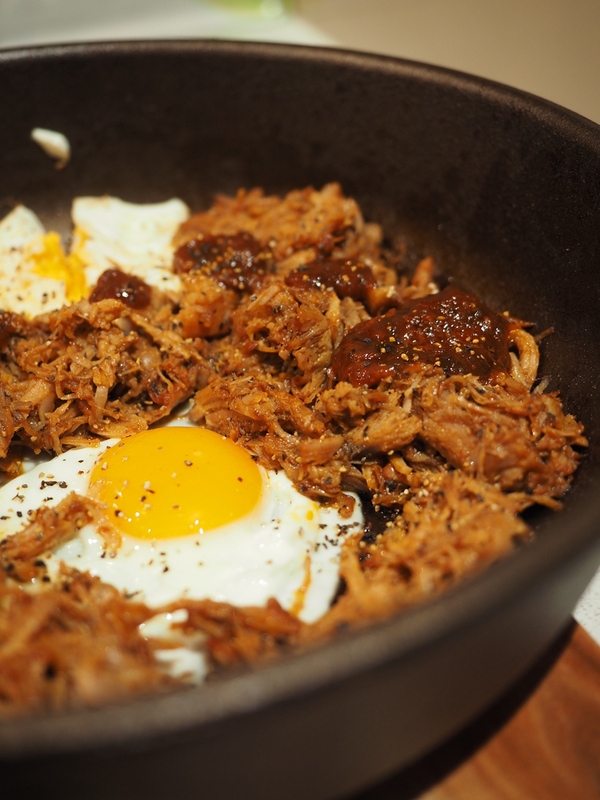 Here you go, my Pulled Pork Breakfast Egg Skillet with Murray Valley Pork. 1. To make the Ranch dressing, mix well all ingredients listed in the “To make the Ranch Dressing” section under ingredient. Season to taste. 2. In a bowl, mix all ingredients listed in the “To make the Asian salad” section and add enough ranch dressing as you wish. I sometimes get emails asking about where to get real organic vegetable and fruit produces. 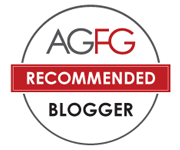 Apart from my regular ones in Adelaide Central Market, I recently found a organic veggie and fruit delivery service, Family Organics, which delivers certified organics on regular basis. I will have a full post out in future to let you know about this service. 3. I have a fantastic recipe to make the bread bun but I will leave it for future to write. Otherwise this post will be endless :P. Anyway, to make up the burger, place generous amount of the pulled pork on the halved bun and top it up with some sliced veggie and apple as listed above. Then, give it a good splash of the ranch dressing and serve. 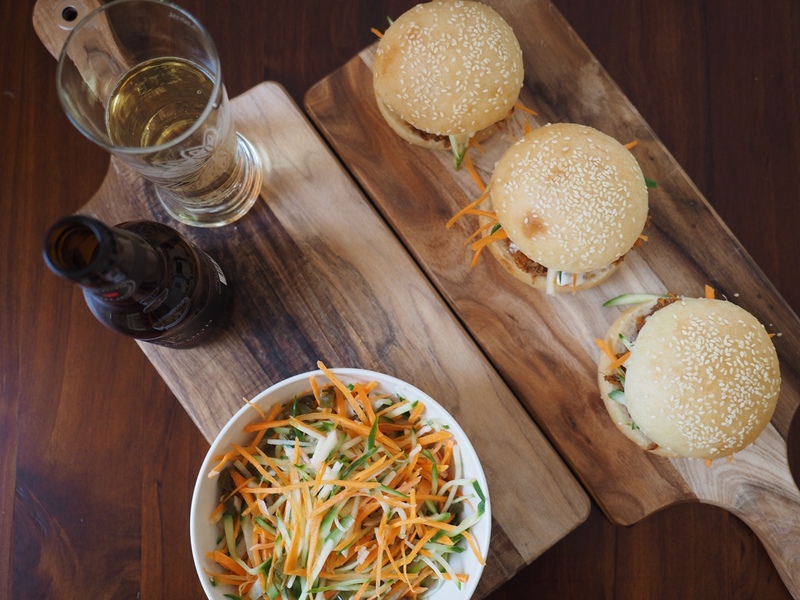 I also served the burger and salad with Sidewood Adelaide Hills Basket Pressed Apple Cider, a local cider which has plenty of fresh apple flavours and I didn’t quite taste the alcohol. 😀 It has also won the Champion South Australian Ciders in the 2014 Royal Adelaide Cider Competition. Adelaide Hills is famous for its cool climate and apples in the region are definitely sweeter and tastier. I recommend all cider lovers to give it a go :). 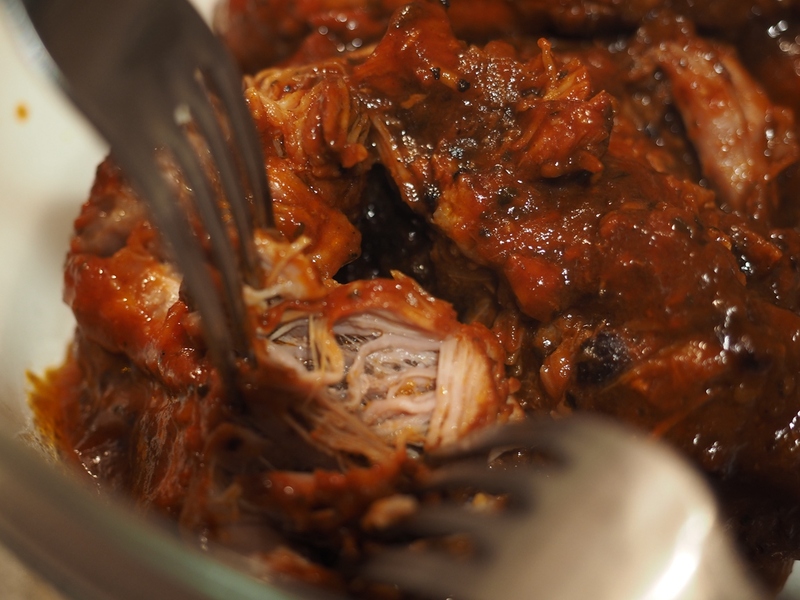 I hope you all enjoy this quick and easy pulled pork recipe and will try to cook some for you next event. If you are craving for a tastier pork than your ordinary daily ones, Murray Valley Pork is definitely the way to go. Their products are suitable for many different cuisines. 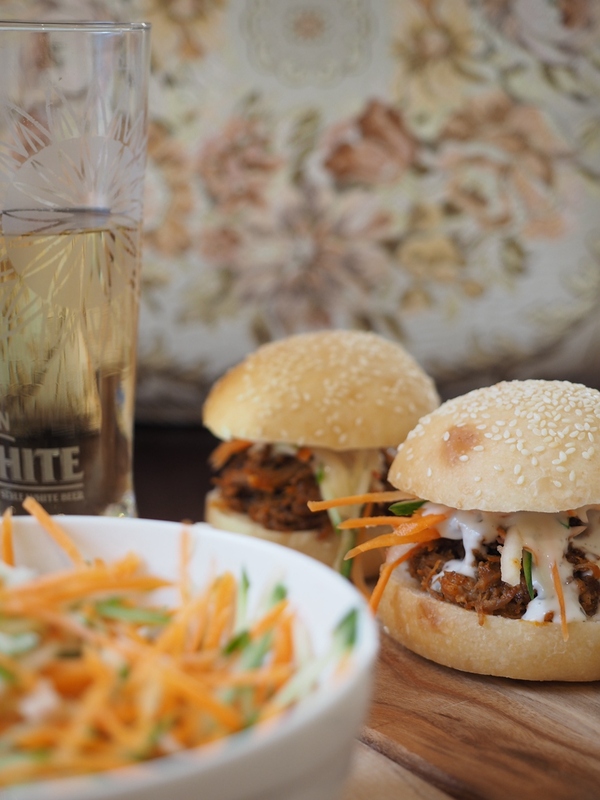 You can get them from Feast Fine Foods in the world acclaimed Adelaide Central Market. PS: If you had charred black marks on the cast iron casserole, the easiest way to get rid of them and clean your casserole is to use baking soda. Put 2 tbsp baking soda into the casserole and add enough water to cover the black mark. Boil the solution and add detergent to soak and wash. Do this a couple of times until the black mark disappears completely. If you like reading this recipe and would like to receive my future updates, please like us on Facebook and Twitter (@Adelaidefoodies). Until the next post, enjoy! This is the exact recipe I have been hunting for a while! All others needed me to cook the pork in oven for ages. I will give it a go in the coming week. Thanks for the recipe! OMG! 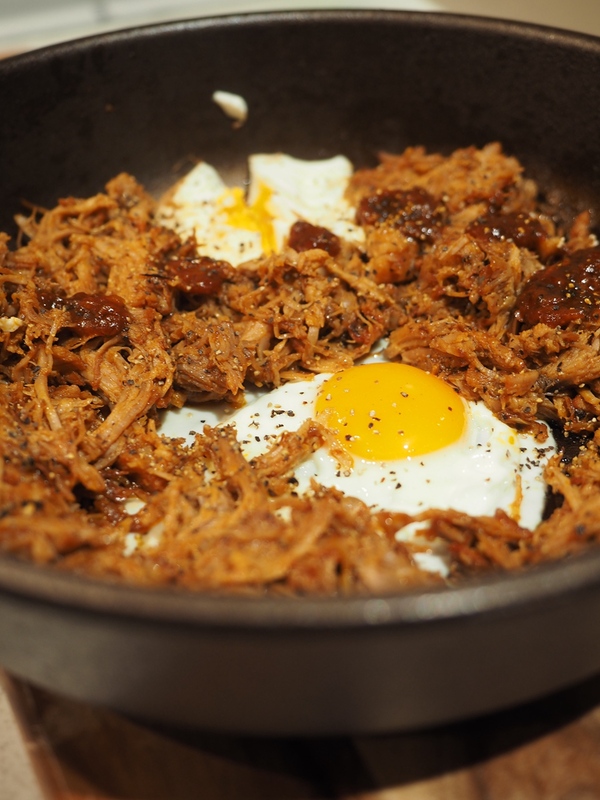 I never thought you could make a pulled pork dish this easy!! Thanks for the recipe. It’s time to dig my pressure cooker out now. Thanks for the compliment. I recommend you use your pressure cooker for as much as possible too. What a great feast! I’d love to add more chilli paste. Just can’t resist! If you love hot and spicy stuff, why not?! These all look absolutely declicious! I bought some Murray Valley pork last week while I was over there but haven’t used it yet. I’m excited to get home and make one of these recipes now.